Marine News contributor Robert Kunkel asks: Are we ready to support the farms? On August 19, 2016, we watched as the fifth tower and associated nacelle was raised on the Deepwater Offshore Wind Farm approximately 3 miles offshore of Block Island, Rhode Island. This is the first Offshore Wind farm erected in the United States and, without a doubt, a huge step forward for this controversial project and alternative energy supply. The Block Island Wind Farm has a total generating capacity of 30 megawatts and is projected to produce approximately 125,000 megawatt hours annually. Put another way, the project boasts enough power to support approximately 17,000 homes in this small island community. Beyond this, it is projected that as much as 90 percent of the generated power will be returned to the mainland grid. Commonplace off the coast of Europe, the installation is nevertheless impressive and is worth describing to North American readers who, until now, could only imagine what this sort of thing might entail. Five General Electric Haliade-150 six-megawatt offshore wind turbines are installed on turbine towers reaching 600 feet tall when the rotating blade is vertical. The blade length is 240 feet with a tip speed of 200 miles per hour when rotating. A rotor speed of 11.5 revolutions per minute is reached during operation in a minimum wind speed of 6.5 miles per hour. At 56 miles per hour, the nacelles are programmed to rotate away from the wind with blades feathered. Each tower consists of three sections standing on a 1,500-ton foundation in 70 to 90 feet of water. A single cable, buried four to six feet deep in the seabed, interconnects the five towers. The transmission cable continues to the island substation ashore with a second transmission cable continuing to the Rhode Island mainland thirty miles away. This power generation is proven technology and deployed around the globe at both land-based applications in the United States and Offshore in Europe and Asia. At each location, the attempt to harness patterned steady winds and transform them into clean, cost-effective electricity has been the target. This particular build is a test application reaching completion after seven years of planning. The projected cost of the electricity generated for the island is far from competitive at this point in its development and the farm still faces a mixed opinion of support. 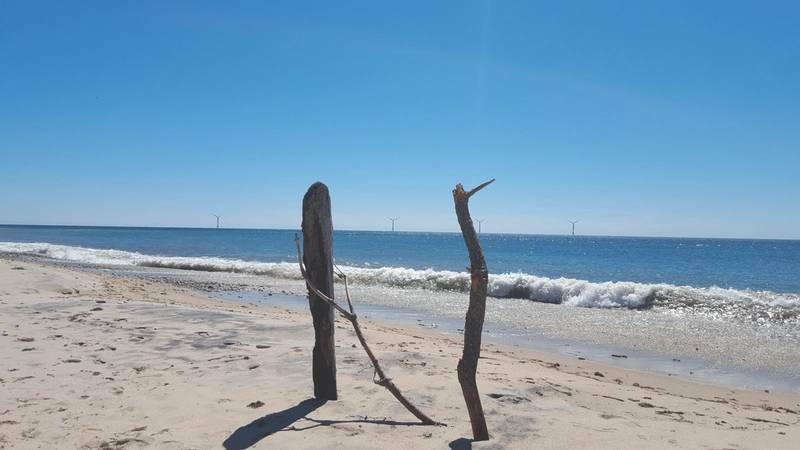 Despite early promises that the farm would be located far offshore its current resting place is clearly visible from the shores of Block Island and from Point Judith on the mainland. 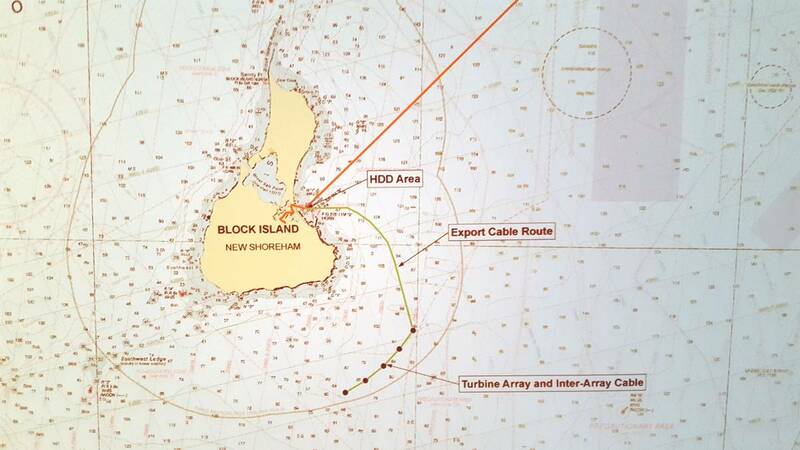 Recent complaints stem from the United States Coast Guard and Federal Aviation Administration navigation requirements lighting the wind farm at night. A series of flashing and blinking lights are now permanent fixtures in what was once a serene, coastal environment. Hence, onshore or offshore, oil or clean energy, the NIMBY or “not in my backyard” is still an issue. The offshore lease has now been extended to 18 towers and turbines. And extension of the test project (now labeled Deepwater One) has the ability to grow to two hundred turbines in the near future. The power generation is projected to serve parts of New England and Long Island, New York reaching in excess of 1,000 megawatts. The offshore wind industry in the United States can create American jobs in the maritime industry. In this case, however, the Deepwater Wind towers were installed by the Fred Olsen Windcarrier’s wind farm installation vessel Brave Tern that arrived in Rhode Island in late July. The 433-foot long jack-up vessel traveled to Rhode Island from Europe, with the five GE Renewable Energy nacelles for the Block Island Wind Farm aboard. This is one of the world’s advanced installation vessels, with cranes capable of lifting 800 tons, and a self-propelled jack-up system allowing the ship to reach a height of roughly 480 during installation. That’s not to say there wasn’t U.S. involvement. There was. Assisting with the installation, the liftboats Paul and Caitlyn, heavy-lift vessels from the U.S. Gulf of Mexico (operated by Montco Offshore) were capable of meeting U.S flag Jones Act requirements to shuttle turbine components from the Port of Providence to the Block Island construction site. Separately, Atlantic Wind Transfers supports essential ongoing operations and maintenance activity, helping to guarantee the performance of the 5-turbine wind farm over the long term. For the lifetime of the Block Island project, Atlantic Wind Transfers will provide crew and equipment transfer services to meet these key logistical requirements. The ‘Atlantic Pioneer’, owned and operated by Atlantic Wind Transfers, the commercial wind support services arm of Rhode Island Fast Ferry, will embark on the first phase of a 20-year charter to support the construction and operation of the Block Island offshore wind farm. The Atlantic Pioneer was built by Blount Boats in Rhode Island and is a 21 meter aluminum vessel that was designed by South Boats IOW, Cowes, Isle of Wight, U.K. South Boats IoW is a pioneer in designing and manufacturing crew transfer vessels and has built approximately 81 crew transfer vessels for the European offshore wind sector, servicing wind farms throughout Europe. It is the first of its kind to be built in the United States. The Vessel is able to safely deliver 16 technicians in comfort, along with three crew and 12 tons of equipment directly to the base of a turbine or offshore platform. With a fuel capacity of 2100 US gallons, the Atlantic Pioneer has the capacity to operate for several days at a time between refueling, and can reach a maximum speed of 30 knots. Real Potential: Will Domestic Stakeholders Respond? Are we prepared to shift our energy concentration with its offshore support fleet and workboat labor force from the U.S Gulf to coastal New England? Does current support vessel design meet the requirements of maintaining an offshore wind farm? If so, how many vessels and trained individuals are required to provide that support? 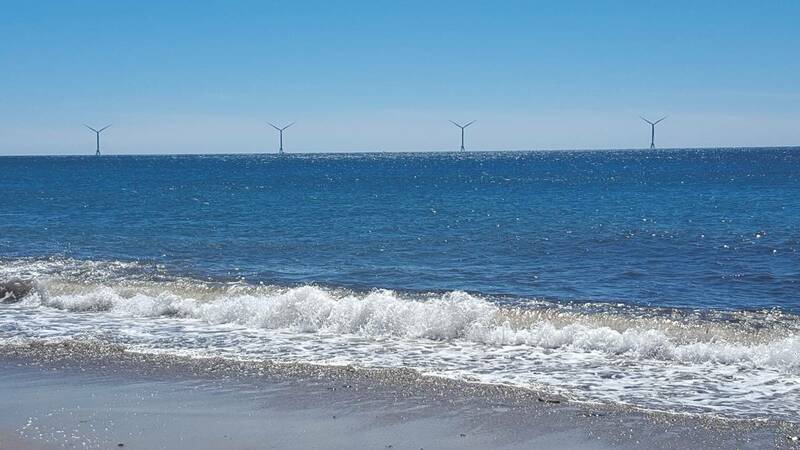 The Cape Wind offshore farm positioned off the coasts of Cape Cod, doomed by political pressure, was faced with EPA emission restrictions addressing the idling of crew and maintenance boats working the wind farm installation. The support requirement is slightly different than the delivery of stores, supplies and labor to offshore oil platforms in the U.S. Gulf. The towers are unmanned with the delivery of technicians to each tower requiring docking systems or boarding platforms not readily available in current U.S. workboat designs. The fact that labor must be efficiently delivered and retrieved each day leads to a discussion of both boat speed and the reduction of emissions using hybrid or LNG propulsion technology while the boats drift in waiting. The Deepwater ONE lease site is 256 square miles and the NIMBY problem continues to force the construction further offshore where Deepwater reports they will be “barely visible from shore.” The size of the lease, its position offshore and the necessity to navigate between towers creates new design requirements. As a workboat industry, are we prepared to make that commitment, provide those designs to support alternative energy and create port infrastructures in a coastal area that has been developed for large tanker and containership terminal operation? Make no mistake: the northern section of the U.S. East Coast through the mid-Atlantic coastal areas are prime wind locations. The first lease area is capable of creating of more than 1 Gigawatt of clean energy with the introduction of the first 200 turbines. The U.S. Gulf offshore industry continues to suffer from the current (low) price of crude oil. At the same time, the unanswered question remains: can clean wind energy rebuild our workforce and revitalize our shipyards? The Block Island wind farm is projected to begin generating electricity in the second quarter of 2017. Are we ready and we will be able to support the shift, should it occur, from South to North when the wind blows? Robert Kunkel, President of Alternative Marine Technologies, previously served as the Federal Chairman of the Short Sea Shipping Cooperative Program under the Maritime Administration and the USDOT from 2003 until 2008. A past Vice President of the Connecticut Maritime Association, he is a contributing writer for MarineNews. 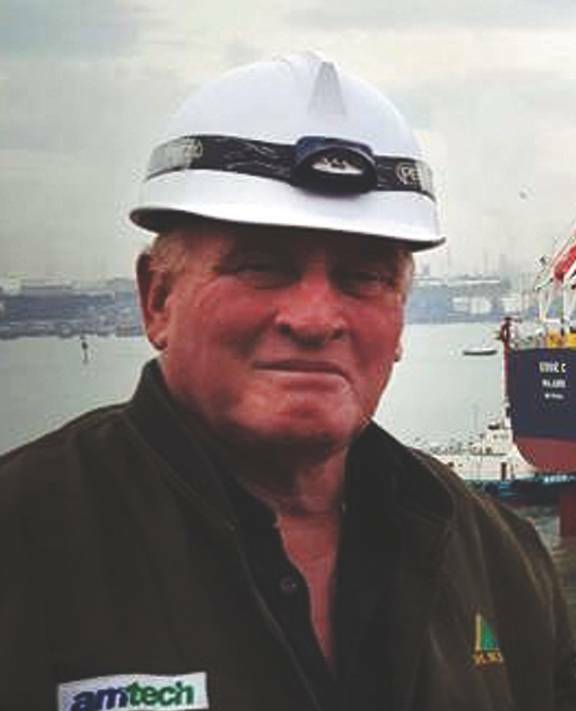 A graduate of the Massachusetts Maritime Academy, Kunkel sailed as a licensed engineer and continued his career in ship construction at NASSCO and Hyundai Heavy Industries, among others. He is a senior member of the Special Committee on Ship Operation with ABS and an elected member of the NCB.